I just configured a brand new vRealize Orchestrator Appliance v6.0.3 with a vCenter Server (not appliance) v6.0U1. The deployment of the OVF is pretty simple, but configuration was trickier than I expected. VMware’s guide is accurate if everything works well but painfully inadequate if you require any troubleshooting. Take a run through the guide, I’m not going to speak to what it does cover, and if you have problems, maybe one of these tips will help you. Currently, r10k does not perform dependency resolution. It’s on the roadmap, but not here yet (RK-3 tracks the effort). Until then, it’s up to you to determine the module dependencies. You can do this by visiting a module’s forge page, then clicking on dependencies, then clicking on each dependency’s forge page and clicking on dependencies until you reach the bottom. That’s pretty boring and a recipe for mistakes. Let’s look at how to automate this. If you use puppet module install, it will install the module and all its dependencies for you. Give it a module and a new temporary directory, to ensure we don’t already have a dependency in our path, and you’ll end up with what you need. Vi is interactive, though, we can do better. Using the magic of sed, I generated a tool called generate-puppetfile that will install the specified modules in temp directories and use the module listing to build a Puppetfile for you. I renamed the utility from depconvert to generate-puppetfile for clarity. Download the utility (git clone https://github.com/rnelson0/puppet-generate-puppetfile.git). Run it and pass the names of modules you want to use. Currently there is no real error checking to be had, so if you enter an invalid name or no name, you won’t get what you want, but errors will be passed to the screen. I hope this helps! Over the past few days, I’ve had to set up an NFS export for use with vSphere. I found myself frustrated with the vSphere docs because they only seem to cover the vSphere side of the house – when discussing the export that vSphere will use, the docs simply said, “Ask your vendor.” If you’re enabling NFS on your SAN and they have a one-click setup for you or a document with settings to enable, great, but if you’re setting up on a bare metal server or VM running Linux like me, you don’t have a vendor to ask. Let’s take a look at what happened in the busybox shell. SSH to your Synology as root with the admin password. Take a look at the permissions on the mount path (e.g. /volume1/rnelson0) and the contents of /etc/exports. rw: Enable writes to the export (default is read-only). async: Allow the NFS server process to accept additional writes before the current writes are written to disk. This is very much a preference and has potential for lost data. no_wdelay: Do not delay writes if the server suspects (how? I don’t know) that another write is coming. This is a default with async so actually has no specific benefit here unless you remove async. This can have performance impacts, check whether wdelay is more appropriate. no_root_squash: Do not map requests from uid/gid 0 (typically root) to the anonymous uid/gid. insecure_locks: Do not require authentication of locking requests. sec=sys: There are a number of modes, sys means no cryptographic security is used. anonuid/anongid: The uid/gid for the anonymous user. On my Synology these are 1025/100 and match the guest account. Most Linux distros use 99/99 for the nobody account. vSphere will be writing as root so this likely has no actual effect. I changed the netmask and anon(u|g)id values, as it’s most likely that a linux box with a nobody user would be the only non-vSphere client. Those should be the only values you need to change; async and no_wdelay are up to your preference. 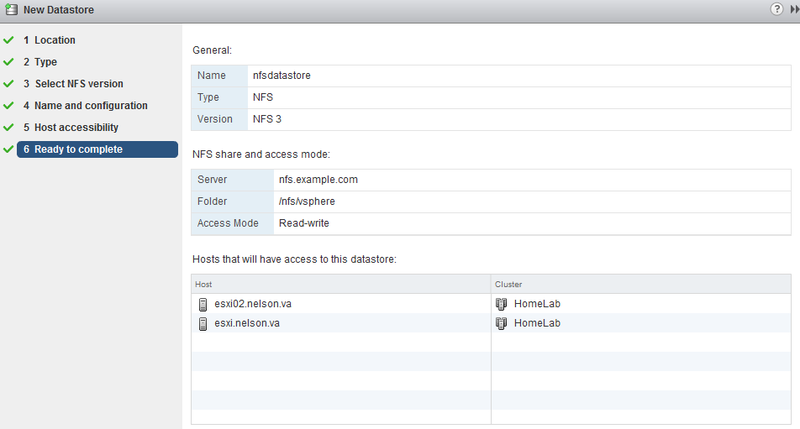 To add your new datastore to vSphere, launch the vSphere Web Client. Go to the Datastores page, select the Datacenter you want to add the export to, and click on the Related Objects tab. Select Datastores and the first icon is to add a new datastore. Select NFS and the NFS version (new to vSphere 6), give your datastore a name, and provide the name of the export (/nfs/vsphere) and the hostname/IP of the server (nfs.example.com). Continue through the wizard, checking each host that will need the new datastore. Click Finish and you have a datastore that uses NFS! You may need to tweak the export flags for your environment, but this should be a good starting point. If you are aware of a better set of export flags, please let me know in the comments. Thanks! The KB article points to DNS, so I checked and found a AAAA record for vCenter. Delete that record, wait for it to replicate throughout Active Directory and expire, and reload the vSphere Web Client. You should no longer see a log failure for IPv6 and your OVF deploy should at least make it past the storage selection stage. I hope this helps!